As I got about a week into this project, it occurred to me that a reader coming in cold would have no idea where to dive in and grab hold of this train. I’m blogging the letters of my uncle Frank D. “Babe” Mauro, but a look at the home page of this site plops the reader in the midst of it all, with no sense of context or chronology. So I’ve adapted this post to be something of a “start here” page. Hopefully, this will give any new readers, if anyone actually comes, a sense of why I’m doing this, where to start and how to catch up. When my maternal grandmother died in 1988, and my mother finished going through her belongings, she found an old train case stuffed with letters. They were letters from my grandmother’s son Babe, letters he had written from basic training and from Italy as he served in the U.S. Army infantry during World War II. At one point, I think during a visit to my parents’ house for Christmas, I made photocopies of all the letters, indexed them, and read them. In part, I was inspired because my grandmother had always stared at me, shaking her head at what she believed was the walking ghost of her son. I never saw the resemblance, but she did. The connection inspired me to research more about who he was and how he died. My research was inconclusive, as you’ll find in the article that my original project yielded. Reading that article might be a good place to start, because it will give you an overview of the story and my interest — and maybe just draw you in more. The article ran April 2, 1995, in Sunshine Magazine, the Sunday magazine that the Fort Lauderdale Sun-Sentinel published at the time. It was a small, back-of-the-book story in an edition of the magazine focused on the 50th anniversary of V-E Day. The cover of that edition of the magazine is what I’ve inserted into this post. Recently, I’ve become interested in pursuing more research on my Uncle Babe, and I also thought it would be worth typing up and sharing the letters he had written. So, that’s what many of these blog entries will be: Typed up versions of the letters he wrote. What I couldn’t do in 1994, I can do now, making the letters available to more people, searchable and, perhaps, an archive for others. I also expect to share stories about the research I have done and the documents I’ve come across. Once you’ve read that article, you could start with the first post I wrote to commence this project and then click the link for the next blog post with each one to follow the chronology of letters and the commentary I’ve interlaced among these transcriptions. what Company was your Uncle in? My Uncle Matt was with the 34th Inf Div 168th Co B 4th Platoon. He was Killed in Italy Nov 23 1943. Hi, Mike. Thanks for commenting. 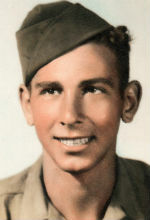 He was in the 34th Inf. Div., 168th Reg., Anti-Tank Co. He was killed May 4, 1945. Do you know much about the circumstances of your uncle’s death?